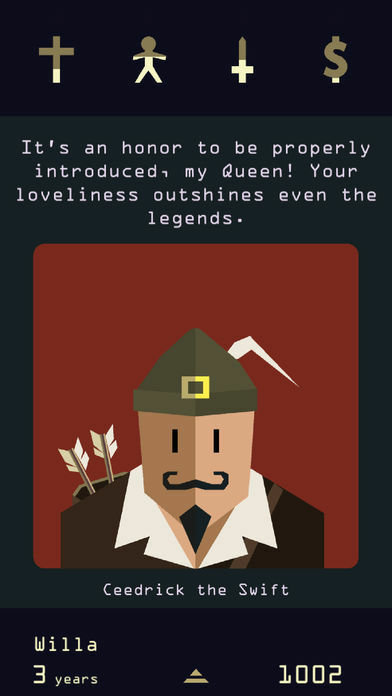 It’s hard to categorise Reigns and Reign: Her Majesty, but they’re most like a Gamebook with a swipe/”Tinder”-style interface. Swipe right usually pleases the person who is requesting something, and swipe left disappoints them, but the outcomes aren’t always so straightforward. In the first game you play as a monarch who has to make endless decisions about the kingdom, which affect the Church, Popularity, Military and Wealth bars. If any of these bars fall to zero or fill up completely, your reign will come to one of a variety of sticky ends. There are a couple of plots you can solve, and mini “quests” to achieve various events (such as “Fight a duel” or “Date a pigeon”) which will also affect your monarch name. And there’s a dungeon labyrinth you frequently get thrown into. As soon as you die, you start playing as a new monarch with a new name. In the sequel you play as the queen (technically a queen consort, since you’re not the actual ruler) and get involved in all sorts of mystical magic and intrigue. You have the same four bars to keep from filling or emptying, but you also have an inventory of possessions which you can use on people to interact with them. There’s an overarching quest which is quite cryptic, involving a hedge maze and zodiac symbols. These games are great fun, and it’s well worth buying the bundle so you can play both of them. Start with Reigns, though, and play the Queen afterwards as it makes more sense that way. Also with the King you can’t seem to continue the game past the year 2000, but with the Queen you can go on apparently forever until you’ve solved it. The idea behind these games is so clever:) I love when people can take an abstract concept and through story and art make it drip with flavor. Thanks for the review – i played Reigns and I will check this out.